Title:Variance stabilization and calibration for microarray data Description:The package implements a robust variant of the maximum-likelihood estimator for the stochastic model of microarray data described in the references. The model incorporates data calibration (aka normalization), a model for the dependence of the variance on the mean intensity, and a variance stabilizing data transformation. Differences between transformed intensities are analogous to "normalized log-ratios". 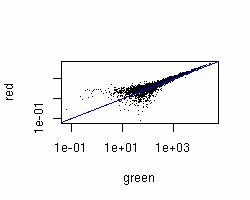 However, in contrast to the latter, their variance is independent of the mean, and they are usually more sensitive and specific in detecting differential transcription. Last ouput from kidney(). For all plots see PDF file. 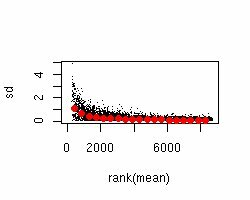 Last ouput from meanSdPlot(). For all plots see PDF file.